Supposed I told you that I had just seen a musical about a girl who had been bullied all her life, and who had decided to get revenge — in particular, psycho-kinetic revenge — upon those who had bullied her? You probably would have thought I had just been to see Carrie: The Musical. Well, I have seen Carrie, but it currently isn’t open in LA, and won’t be returning until October 1st. Rather, I was talking about Matilda: The Musical (Tour) (FB), the musical we saw last evening at the Ahmanson Theatre (FB). It was a wonderful performance and I recommend the show highly to everyone, not just because it is a fun and well-performed show, but because of the conversation that is changing because of shows like Matilda and Carrie. You might as well be saying you think that it’s OK.
And if it’s not right, you have to put it right. The message is a strong anti-bullying message: a message that you can’t let people bully you, and that it is up to you to change your story — that is it up to you to put it right. It is in this message that there is a parallel to the story of Carrie White; it is in this message that (I believe) is the reason that Matilda has stuck such a chord in the hearts of adults and children alike. The message is a simple but strong one: stand up to bullies — you have the strength and obligation to do so. It is a message that is very important these days, as we’re seeing those who have been bullied exact all sorts of revenge on those who bullied them (it seems a common theme in school shootings). If we can stop bullying as it begins, our children will be much better off. Matilda puts it in a much more palatable fashion than Carrie. In Matilda, nobody dies and the bullies just give in and go away, vs Carrie where almost everyone dies. Matilda succeeds because it is the happy ending that we want; Carrie is the ending that we get far too often. It is unclear how much of the audience consciously connected with this message and this parallel. To most of them, this was an entertaining story about a little girl with bad parents and a mean headmistress who beats the adults and ends up happy. Who doesn’t love happy endings? Who doesn’t enjoy being a little bit naughty? But children love Roald Dahl’s stories because of the deeper message — for example, what Charlie and the Chocolate Factory teaches about the various vices and virtues. This story, through humor, also teaches a valuable message about the value of self, and the value and importance of standing up for one’s self. It teaches that you need to write your own story, and not let others dictate it. I just realized I’ve been blathering on about the story without providing you a short synopsis. After all, you might never have read the novel; you might not have seen the wonderful 1996 movie with Danny DeVito, Rhea Pearlman, and Mara Wilson. As opposed to trying to detail it all here, I’ll point you to the Wikipedia page. The “TL;DR” version is: Matilda is a precocious and intelligent little girl born to parents who didn’t want her, and who value stupidity and the messages that TV teaches over reason. Unable to control her (Matilda loves to play pranks on her parents), then enroll her in a school run by an evil headmistress who delights in torturing children. One teacher sees Matilda’s value, and working together they fight the headmistress, and return the school to a place of love and learning. Oh, and Matilda gets a happy ending as well. In adapting this story to the stage, the authors imbued it with an additional message that was not the novel or the movie — a message that is a commentary on parents today. In the opening scenes, there is a birthday party where every parent is talking about how their child is a precious little miracle and something special. This, of course, creates a contrast with Matilda’s parents who see her not as a miracle and as something not special. The point that is being made is that if everyone is special, then no one is. Special becomes the norm, and the truly special become invisible. The reality must be that we, as parents, must not predefine our children with labels, but must encourage them to grow up and be whatever they are destined to be (and be the best at that). As you have probably guessed by now, I liked the story of Matilda and its message. I think it is a strong one that needs to be learned. The related question is: how well did the playwright and composer adapt this message for the stage, and integrate it into the musical form. The answer is: reasonably well. I’ll go into performance, creatives, and technical in a minute, but story-wise I have a few quibbles. The first is the Act I ending, which I found too abrupt. You want Act I to end with a rousing number to get you talking during intermission and wanting to come back. Instead, you get Matilda alone on stage going “But That’s Not Right”. Other than that, I found the structuring of the story fun and well-paced, and I thought that the songs were more than just entertaining patter. In particular, the songs did a great job of illustrating the wants and motives of the characters; they illustrated and illuminated personalities and drives. This is what the songs in musicals should do. Before I turn to the performers, I want to turn to the audience for a second. We saw the show on July 4th — an early evening show. There were lots of kids in the audience, as the show was heavily discounted (as it was on a holiday). There were kids that were enthralled by the show, and I can easily see how shows like this could turn kids into theatre lovers. My favorite point, however, was one point where two characters kissed somewhere near the end. At that precise moment, from the audience, comes a loud “Yuk!” from a little kid. Priceless. The performances in Matilda were top rate. In a manner similar to Billy Elliott, the demands on the child in the lead role are so great that three are cast (in the case of Matilda, Gabby Gutierrez, Mia Sinclair Jenness (FB), and Mabel Tyler (FB)), and they alternate. At our performance, Mabel Tyler (FB) was Matilda, and she did a wonderful job with the role. For a child that small she had a great singing voice; she moved and danced well and brought a lot of energy to the stage. It was clear that she was just having the time of her life in the role, and that is something that always is telegraphed in a performance. Her parents were performed by Quinn Mattfeld [Mr. Wormwood] and Cassie Silva (FB) [Mrs. Wormwood]. We’ve seen Ms. Silva before at Cabrillo Music Theatre (FB) [42nd Street and Seven Brides for Seven Brothers], and she was equally strong here. She was having fun with her role, and did a wonderful job on “Loud” and in her opening scene. Mattfeld was great as Mr. Wormwood, playing the role with loads of humor. This came across best in his second act opener, “Telly”. Next there is the staff of Crunchem Hall, Matilda’s school: Miss Jenny Honey and Miss Abigail Trunchbull. Trunchbull was played to scenery-chewing perfection by Bryce Ryness (FB). Ryness didn’t attempt to hide the fact he was a man playing a woman; he knows what and who is character is and how to work it. This is apparent from the first time you see him on stage with Miss Honey, and it continues in every appearance. He just delights in the character, and it comes across. Jennifer Blood (FB)’s Miss Honey, on the other hand, is meek sweetness and light, a gentle soul forced to find inner strength by a little girl who understands her story better than she does. She gives a great performance and has a wonderful singing voice that she uses on numbers such as “Pathetic”, “This Little Girl”, and “Quiet”. In terms of the other named characters and the ensemble members, there are a few I would like to highlight. As Bruce Boxtrotter, Evan Gray seemed to be having great fun in both his signature cake-eating scene as well as his post Chokey scenes. Equally precocious was Kaci Walfall (FB) as Lavender in her opening bit after “Telly” at the top of Act II. Of the adults, I particularly enjoyed Ora Jones as Mrs. Phelps, the librarian. She brought a wonderful excitement to the role as Matilda was telling the story of the Acrobat and the Escape Artist. Lastly, I want to note Danny Tieger (FB) as Michael Wormwood: his role was small, but I particularly enjoyed his well timed outbursts during “Telly”. Rounding out the cast in various smaller roles and as part of the ensemble ( indicates children) were: Jaquez Andre Sims (FB) [Party Entertainer, Rudolpho]; Ian Michael Stuart (FB) [Doctor, Sergei]; Justin Packard (FB) [The Escape Artist], Wesley Faucher (FB) [The Acrobat];  Cal Alexander [Nigel];  Kayla Amistad [Amanda];  Aristotle Rock [Eric];  Cassidy Hagel [Alice];  Megan McGuff [Hortensia];  Meliki Hurd (FB) [Tommy]; and the ensemble: Michael Fatica (FB), John Michael Fiumara (FB), Shonica Gooden (FB), Stephanie Martignetti (FB), and Darius Wright (FB). Swings were Cameron Burke (FB),  Brittany Conigatti, Camden Gonzalez (FB), Michael D. Jablonski (FB),  Luke Kolbe Mannikus (FB),  Serena Quadrata, and Natalie Wisdom (FB). One note on the ensemble: At times, the ensemble appears to play older kids. Given that the school only goes to 11 year olds, the apparent age of the old kids is a little off-putting. I can understand the demands of the characters, though, so I’ll suspend my disbelief. Bringing this team together creatively was Matthew Warchus [Director], Thomas Caruso [Associate Director], Ryan Emmons [Resident Director], Peter Darling [Choreographer], Ellen Kane [Associate Choreographer – Worldwide], Kate Dunn [Associate Choreographer – U.S.], Andrew Wade [Voice Director], and Victoria Navarro [Production Stage Manager]. Michael D. Jablonski (FB) was the dance captain; Camden Gonzalez (FB) was the assistant dance captain and children’s dance captain; and Michael Fatica (FB) was the assistant dance/gym captain. I’ve noted before that I often have trouble telling where the director stops and the actor begins. That is certainly true here for the adults (and especially true for Ryness’ Trunchbull), but the director did a great job of bringing out the characters in each of the children. Dance and choreography was excellent, especially the movement up and down the set and the acrobatics. Matilda was under the music direction of Matthew Smedal (FB), who also served as the conductor (and keyboard 2) of the Matilda orchestra. Chris Nightingale was the music supervisor and orchestrator; David Holcenberg was the associate music supervisor. Musicians included Bill Congdon (FB) [Keyboard 1, Children’s Music Director; Assistant Conductor], Joshua Priest [Percussion], Anna Stadlman (FB) [Bass], Sal Lozano [Woodwind 1], Jeff Driskill [Woodwind 2], Daniel Fornero (FB) [Trumpet 1], Rob Schaer [Trumpet 2], Robert Payne [Trombone / Contractor], Thom Rotella [Guitar], and David Mergen [Cello]. Other musical credits were: Phij Adams [Music Technology], Laurie Perkins [London Music Preparation], Emily Grishman [New York Music Copyist, Music Preparation], Katharine Edmonds [Music Preparation], Howard Joines [Music Coordinator]; and David Witham [Keyboard Sub]. In general, the music sounded good but didn’t have the oomph that a good show orchestra should have. There were also portions where it sounded like the children’s ensemble was pre-recorded, which was a bit off-putting. Lastly, there is the technical side of things. Rob Howell‘s set and costume design imagined the stage as these colossal piles of blocks. I didn’t really like it when I saw it on the Tony Awards, but it worked really well on stage — especially during “School Song” where blocks were inserted into the walls providing the ability to climb. The costumes and wigs also worked well, particular those for Mrs. Wormwood, Mr. Wormwood, and Miss Trunchbull. The illusions by Paul Kieve worked very well — particularly the chalk writing by itself on the blackboard. The sound design by Simon Baker worked reasonably well and wasn’t overpowering; the primary problem was distinguishing what the children were singing over the accents. This could be a problem with amplification on the kids, or it could be that the children’s ensemble was pre-recorded and muffled. There was also a point during “Quiet” where there was this odd echo from the orchestra area — I couldn’t tell whether it was intentional, or whether someone’s assisted listening device was malfunctioning and shouting to the world. The lighting design of Hugh Vanstone was particularly effective — there was one scene in the second act where the lighting suddenly changed to red and thunder was heard — sending a chill through me. Well played. The remaining production credits were: Casting – Jim Carnahan C.S.A and Nora Brennan C.S.A (children); Production Management – Aurora Productions; Company Manager – R. Doug Rodgers; General Management – Dodger Management Group. 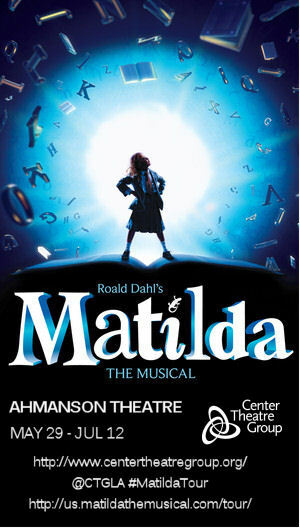 Matilda: The Musical (Tour) (FB) continues at the Ahmanson Theatre (FB) until July 12. Tickets are available online through the Ahmanson; midweek discounts are available through Goldstar. The tour is next in San Francisco — so my Bay Area peeps should look into tickets there at the Orpheum (it looks like Goldstar tickets have expired). It is a fun show well worth seeing. Los Angeles’ 4th of July Block Party. As we transited to and from the theatre (we used LA Metro), we had a chance to visit the big 4th of July Block Party at Grand Park (FB). Security was tight, including searches and pat downs, but I can understand the city wanting to make things safe. We had to argue with a security guard as he thought my wife’s walking staff was a weapon; luckily, we got that overridden. We didn’t get to the food trucks — they didn’t have the greatest of layouts. We did, however, get to demonstrate being friendly natives — we directed a number of people regarding visiting our city. In general, it seemed to be a reasonably well run and organized event. Upcoming Shows: July is a month of double-headers. Next weekend, our double-header July continues: On Friday night, July 10th, we’re seeing Colin Mitchell‘s show Madness, Murder Mayhem: Three Classic Grand Guignol Plays Reimagined at Zombie Joes Underground Theatre (FB); Saturday July 11th brings “Jesus Christ Superstar” at REP East (FB). The following weekend is another double header: “The History Boys” at the Stella Adler Theatre (FB) on Saturday (Goldstar), and “Green Grow The Lilacs” at Theatricum Botanicum (FB) on Sunday. The last weekend of July brings our last double: “Lombardi” at the Lonny Chapman Group Rep (FB) on July 25th, with the annual Operaworks show the next day. August start calming down, with “As You Like It” at Theatricum Botanicum (FB) the first weekend of August, our summer Mus-ique show the second weekend of August, and “The Fabulous Lipitones” at The Colony Theatre (FB) the third weekend of August. After that we’ll need a vacation … but then again we might squeeze in Evita at the Maui Cultural Center (FB) the last weekend of August. September right now is mostly open, with the only ticketed show being “The Diviners” at REP East (FB) and a hold-the-date for “First Date” at The La Mirada Theatre for the Performing Arts (FB). October will bring another Fringe Festival: the NoHo Fringe Festival (FB). October also has the following as ticketed or hold-the-dates: Kelrik Production (FB)’s Urinetown at the Monroe Forum Theatre (Hold for Sat 10/3); “Mrs. A. Lincoln” at The Colony Theatre (FB) (Ticketed for Sat 10/10); and “Damn Yankees” at Cabrillo Music Theatre (FB) (Ticketed for Sat 10/17). As always, I’m keeping my eyes open for interesting productions mentioned on sites such as Bitter-Lemons, and Musicals in LA, as well as productions I see on Goldstar, LA Stage Tix, Plays411.